The new multi-gym Plus of Kettler is the development of the well-known multi-gym module. This multi-gym is upgraded with the 3D-Flex-Motion system. Do free cable pull exercises with the lateral arms and hence benefit from more diversion for your training. Besides a multitude of training exercises, the free exercises on the cable pull offer the advantage that the course of motion is free and hence more muscles are challenged. 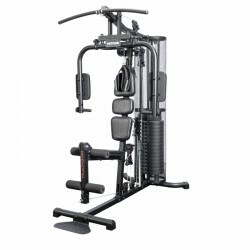 The Fitmaster is a compact entry-level multi-gym by Kettler with butterfly, chest press, lat pull, leg curl, and cable pulley modules. The Kettler multi-gym Fitmaster is particularly suitable for rooms with a low ceiling height (i. e. cellar) as it is only 200 cm high. The Kettler Multigym is a multi-gym for starting with a weight block of 80 kg and diverse pull and press modules. The Kettler Multigym offers many exercises for strength training at home. Thanks to its low height, the multi-gym fits in almost each workout place. 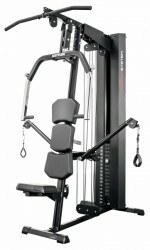 The Kettler multi-gym Kinetic Basis is the basis of the new system. The basic module can be upgraded by 4 different modules and is thus very flexible. The basic module is already a very versatile training equipment and can be upgraded by the following components: double cable control, leg extension/leg curl or leg press as well as dip/chin-up/leg lifter. The Kettler curlpult Delta XL/Classic/Primus/Alpha Pro offers a correct biceps workout on the Kettler multi-gyms Delta XL, Classic, and the training station Primus. Users, who look for an affordable but high-quality multi-gym, are well provided with a Kettler multi-gym. It combines a big range of functions and high manufacturing quality. Those who prefer training at home rather than at gym, Kettler offers several options for a varied and flexible workout at home. The wide range of offers of Kettler responds to individual needs of the users for a customized strength training - no matter being a leisure bodybuilder or already a professional sportsmen. Deciding for a Kettler multi-gym means to focus on diversion and reliability. 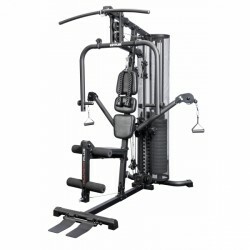 Which Kettler multi-gym is the best one for me? It depends upon the training you want to do with a multi-gym as well as upon your experience with such a machine, which Kettler multi-gym is best for you. You can already do the most important basic exercises for single muscle zones with many affordable basic models like the Kettler Multigym. Being the ideal beginner model, the weight stack of 80 kg of this multi-gym still offers enough reserves to benefit from it even for a quicker progress. This home gym is also a good choice for restarting strength training, when you come back to your training rhythm and want to strengthen your muscles again. Being just 200 cm high, the Kettler Multigym fits also in rooms of low ceiling height, i. e. a cellar. Multi-gyms like the Kettler Kinetic Basis offer wide-range training possibilities (i. e. butterfly exercises for the chest). 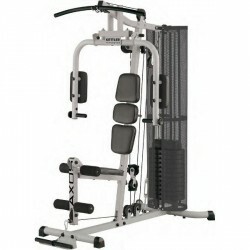 This system provides diverse modules like a leg press for additional integrateion and presents a complete gym for use at home. 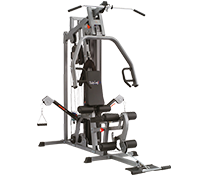 The Kettler Fitnesscenter Classic or the Fitnesscenter Delta XL including all their promotion sets are perfect for the training with free weights like a barbell and meet the requirements of experienced strength sportsmen as well. Kettler multi-gyms also convince by functionality and design. A soft, modern design of the machines meets a user-friendly operation. The adjusting mechanisms of the Kettler multi-gyms are of good workmanship and allow the adjustment of the machines to the user and the respective strength training exercises. Besides a neat and technically perfect workmanship of upholsteries and backrests, multi-gyms of Kettler convince by high-quality cable pulls and frames for optimal training comfort and high ergonomics. The assembly instructions of Kettler also need to be emphasized with their detailed illustrated steps for precise mounting of the multi-gym as well as easy-to-understand descriptions for correct doing of diverse strength exercises.